If you ever want to be financially independent, I mean truly free from having to worry about that next paycheck, you have to be making residual income. That means having income-generating assets that consistently make money without you having to bust your hump at work. It’s something most people miss, working all day for someone else. Their work goes to produce assets for someone else. They never have ownership of their work or the income it brings in the future. I was there and I hated it. I spent the better part of my 20s and 30s working for someone else until I learned how to create my own products and how to take control of my own financial future. I started creating products, websites and investments that would make money 24/7 – even making money while I slept. 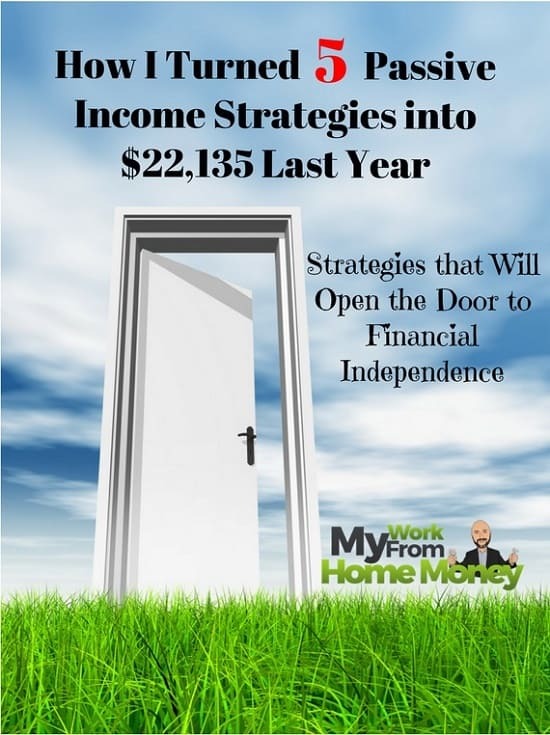 Five of those residual income strategies made $22,135 just in the last year alone. 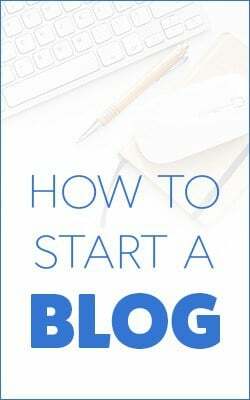 That’s a fraction of the $90,395 I made in the last 12 months as a blogger and freelancer but these five residual income strategies are my favorite for truly passive income. The surprising fact is that it’s easier than you may think to get started in these five strategies. Some involve almost no work upfront while others may take a couple of months, but they all will produce an income for years after. Throughout this roundup of my favorite residual income ideas, I’ve included links to full guides on each strategy. Use the guides to get started and email me if you have any questions at all. Technically, residual income is the money left over after all your bills are paid. Passive income is money you make with little or no effort, maybe from an investment or from a product you created. 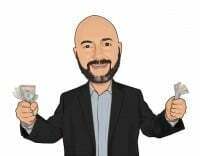 I’m combining the two ideas here for passive income ideas that will make you so much money you’ll have enough to pay the bills and then some! Three of the residual income strategies below are my favorite investments, three types of investments that are maybe a little out of the ordinary but will produce consistent cash flow. Even if you can’t find the time to create your own passive income products, you can put your money to work so it earns you a return. The other two ideas are about creating something that will make you money every day, every month and every year forever. While the investing strategies can be set up in a day or two, it’ll take longer to start on the residual income ideas but your time will be paid in a passive income for years. Building passive income with peer lending is really nothing new though you probably didn’t know you were doing it before. Peer loans are personal loans to individuals. In the past, banks would sell their loans to pension funds and insurance companies that needed safe investments with stable cash flows. Some of the money you have in a work-sponsored defined benefit plan or your insurance premiums are probably invested in bank loans. Now with P2P websites like Lending Club, you can cut out the middleman and invest directly in the loans. This means a higher return for investors and fewer roadblocks for borrowers. I’ve been investing in peer loans for years and have earned a consistent return near 10% on the loans. It’s one of the best income-generating assets available because you get paid interest plus part of the loan amount each month. Over just the last year, I’ve earned income of $870 just in interest payments. I did a review of Lending Club on my personal finance blog. It’s the largest peer lending platform with more than $26.6 billion in loans funded. The platform has an automated tool that lets you pick the criteria for loans in which you invest to make it a completely passive investment. Get started on Lending Club today. Open a retirement account and your income proceeds will be tax-free until retirement. I’ve been buying and managing real estate for nearly 20 years. I started buying single-family rentals just after I got out of the military and have since bought commercial and multi-family properties. Building residual income through real estate is about as old as time itself. No other investment has created as much legacy wealth for the rich. But few other income-generating assets come with as many problems either. I have someone manage my residential properties now but have had to work through just about every headache imaginable. I didn’t always buy in the best neighborhoods, which multiplied my tenant problems by 100. Over the decade managing my own properties, I had to learn electrical, plumbing and more than a little carpentry. Just in the last five years, the online revolution has caught up with real estate investing. 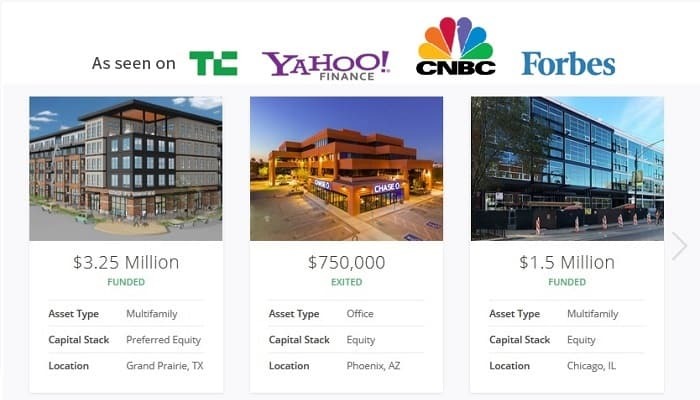 Now investors can put their money to work as partners in large real estate projects through crowdfunding. The process works like this, real estate professionals post their projects on crowdfunding sites like RealtyShares for investors to review. Analysts and underwriters at the website dissect the investment documents and the professional’s experience before the project gets listed with only about 5% making it in front of investors. Debt investments for regular cash flow as well as an equity stake in properties are available. The platform manages the payments from the developer to investors making it a completely passive stream of income and about the easiest way to get direct exposure to real estate. 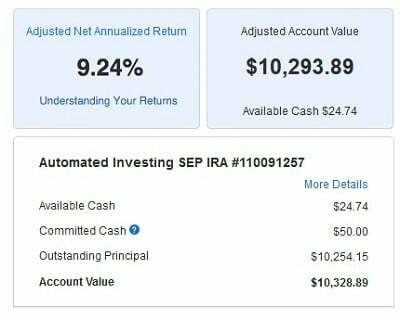 I just started investing earlier this year so don’t have any details yet but returns range from around 9% to well into double-digits for equity ownership. You can browse projects for free on RealtyShares with minimum investments of $2,000 for most deals. One of my favorite themes in investing is dividend stocks. I like to watch stock prices go up as much as anyone but it’s nice when an investment puts money in your pocket on a regular basis as well. Dividend income has accounted for 34% of the total return to stocks since 1926 and is the only source of positive returns during years when stocks crash. Dividend stocks, especially companies that regularly increase their payout, have consistently beaten the rest of the market. I have a few online investing accounts to get access to research but my long-term investment money goes into my Motif Investing account. Motif is different from other online brokers because it lets you buy up to 30 stocks and funds for just one commission. For example, I invest in a mix of 17 bond funds and stocks in a retirement portfolio on Motif. The group gives me broad exposure in fixed income and stocks but would cost upwards of $170 in commissions to buy each individually on another website. With Motif, I pay just $10 each time I want to put money to work in the group of investments. 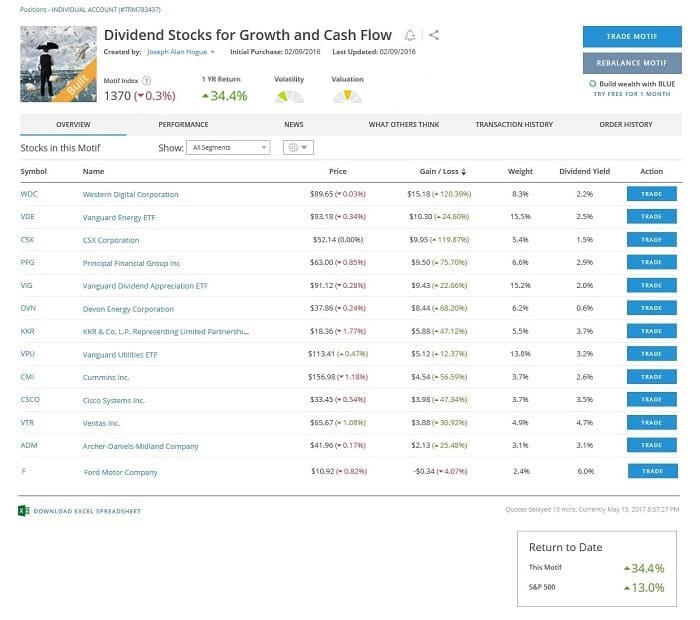 My income-stocks have gained $1,020 over the past year including the 3% average dividend yield. Dividend stocks are not generally the highest-yielding investment but they are safe relative to real estate and other residual income sources. Invest in income-producing stocks across different sectors and industries. Investing only in traditional dividend sectors like utilities and telecom sets you up for a lot of interest-rate risk. Invest most of your portfolio (50% to 70%) in broad dividend funds for maximum diversification. Invest the rest in individual stocks for higher returns and monthly income. Look for companies that pay out between 40% to 70% of income as a residual dividend. This signals management’s commitment to income investors but still leaves some cash flow for growth. The next two ideas will take longer than the residual income investments above but cost nothing to get started and will provide passive income for years. I don’t usually consider freelancing a source of passive income. Freelancing is just another way of saying you’re working for yourself, doing project work for other people or businesses. Most of the time, freelancing isn’t residual income because you continuously have to be finding new clients and completing projects. That’s until I found one way to make freelancing almost completely passive. Fiverr is an online freelancer marketplace. Unlike others where someone posts a job to be done, freelancers post their own ready-made projects on Fiverr. You describe a job you are willing to do and for how much you will do it, anything from design to IT to just about anything (yes, people will pay you to do just about anything). While a lot of the ‘gigs’ posted on Fiverr mean continuous work for the freelancer, there is a way to make it more passive with less ongoing effort. The idea is to create printables or guides around a very specific need. Start by browsing some of the other available projects on the website. Browsing through the topics, you’ll see that it’s really up to your experience and you can create a project around just about anything. You’re only going to be selling these for $5 to $15 each so it doesn’t have to be a 500-page novel. I have three projects for sale on Fiverr and have made $890 over the past year on prices of $5 and $10 each. It may not seem like much but it’s almost completely passive once you’re done with the project and can really add up if you’ve got five or six projects on the site. This last residual income idea involves a little more work than the others but has been my biggest money-maker over the last year…and I mean huge money! I’ve been self-publishing since March 2015 – that’s only a little over two years but I’ve made $19,355 just in the last year. I’ve got ten books available on Kindle, paperback and audible. 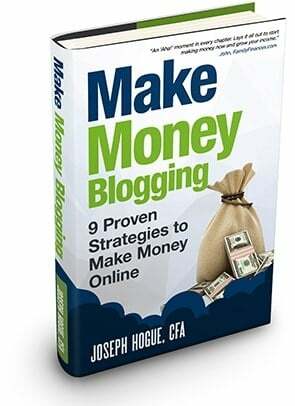 All of them are non-fiction around investing, making money and other topics I write about on my blogs. Everyone has a book idea that pops into their head every once in a while, whether it’s a fictional story or a how-to they want to share. I’ve seen people write up their life’s story and publish it. You can self-publish anything! Brainstorm your idea. For non-fiction, write about something you know very well like your occupation. Check out the Table of Contents in other books on the topic for ideas on what your book should include. Start by outlining your Table of Contents and the major sections within each chapter. Break the writing into chapters and sections. You don’t have to write from the beginning, write out each chapter as it comes to you. 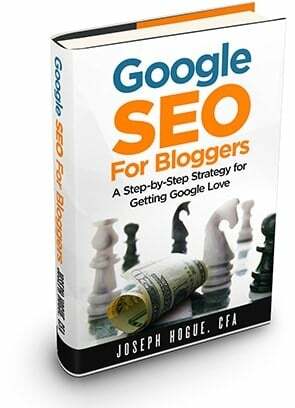 Find someone on Fiverr or another freelancing site to design a cover and format the book as an ebook. I write every day but even someone only working on it a few days a week can put out a book or two each year. 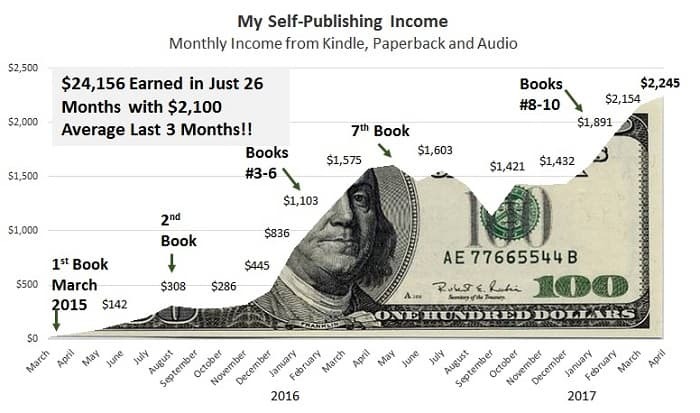 I average $200 in sales on each book, each month and it’s completely residual income. Once the book is launched, it will rank in Amazon’s categories and there’s really nothing you need to do. I love your methods, however you need money to get started. Trying to get there! Once I got some money to play with I’ll be sure to make use of your methods. Great content, thanks! And keep going! It does help to have a little money to get started Sebastian. Important though to just get started with any income strategy, little by little.